Angie Bradock is at it again. There's another murder in Rolling Brook, and once again Angie is the one who stumbles across the body. She's an endearing busybody who just can't leave the investigations up to police, much to Sheriff Matthews chagrin.My favorite character is back- Oliver, the timid, bird-phobic French bulldog. This time he adds two sidekicks: Dodger, "his" kitten and Petunia the Nubian goat. Their escapades kept me laughing. Adding to the mix, mischievous twin boys and a goth teen, provides wacky entertainment throughout the story.With the gentle faith of the Amish, cozy mysteries seem to be a perfect fit for all the little Amish towns across America. The next book in this series is set at Christmastime and I can't wait to see how the Amish celebrate in Rolling Brook. Angie is expecting her parents for the holidays, and mom is bringing quite the surprise with them. Should be the makings of another funny and entertaining cozy mystery. 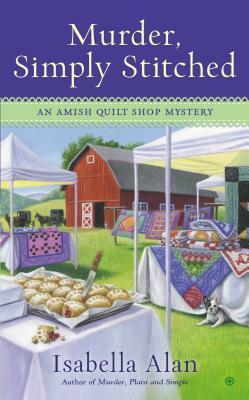 MURDER, SIMPLY STITCHED is the second book in Ms. Alan's Amish Quilt Mystery series. There are some references to the first book Murder, Plain and Simple, but I didn't find it necessary to have read the first book as it stands alone. MURDER, SIMPLY STITCHED is written in first person, which might turn some readers off, but it didn't bother me. I enjoyed being "in Angie's head" as she tried to solve the mystery. Some of the events in the book are slap-stick comedy, some are just thrown in for shock value (I think) but it equaled a great book that I couldn't put down. I did have some suspicions who the "bad guy" was, but wasn't totally sure until it was revealed. If you like cozy mysteries and Amish stories, you will love MURDER, SIMPLY STITCHED. A great book that I couldn't put down. I liked this one, but not as much as the first one. Angie pulls stunts in this one that are absolutely unbelievable. Hard to think anyone could actually be that stupid about some of the things she does. Nevertheless, a good story dealing with the idea of how far you'd be willing to go to save someone you love. Reading about the simple things in an Amish community is refreshing. But murder, not so. Angie is obsessed with finding out who the murderer was, that she acts without thinking. Her dog Oliver and. a goat named Petunia keep me laughing. This series is a nice cozy mystery read..Enjoy. Angie runs her late aunt's Amish Quilt shop. As an Englisher, Angie has made several Amish friends in the area, though there are still those who are skeptical including Martha Yoder who cared for Angie's late aunt. Martha has since opened a 'true Amish' quilt shop right next door to Angie!Angie decides to sell some of her aunts quilts in the local Amish auction to help make the quilt shop payments.As the first Englisher to sell at the auction, Angie wants to make sure everything goes smoothly so she can continue and perhaps others like herself join in later. All seems well until Petunia the pet goat gets out and Angie goes chasing after it as Petunia leads her to the canning shed and a dead body! Wanda is holding the pie that Rachel gave to Wanda not long ago, partly eaten! Angie knows her Amish friend Rachel would never kill Wanda, but it isn't looking good as many have seen her and her husband Aaron arguing with Wanda over a pie factory proposal for town. Wanda,adament that the factory would deter from the charm of the town, while Aaron's livelihood is at stake. Any book with a goat running amuck is on my favorites list! Such character these guys have and even better sleuthing skills. Good clean country fun including the ways of the Amish through baking, quilting, sewing, and fellowship. Angie sleuths away trying to get her friends off of the suspect list, much under the radar of the handsome sheriff who seems to have a thing for Angie. The country charm and a little bit of romance will keep you reading to find out who killed Wanda and why in this fun cozy mystery! In book 2 of this sweet series, Angie is finding her niche as the new owner of her late aunt’s Amish quilt shop, Running Stitch. To drum up some business, Angie decides to sell her quilts in the Rolling Brook Amish Auction, including some of her aunt’s most prized works.While at the auction, Angie stumbles upon the body of township trustee Wanda Hunt behind a canning shed. She appears to have been killed by a poisoned blueberry fry pie from the table of Rachel Miller, Angie’s closest friend. Angie feels compelled to help clear her friend and the race is on.I enjoy these books because Angie doesn’t stupidly put herself in harm’s way – well, at least not too much. I also liked that her relationship with the sheriff is moving along, and I appreciated that the romance party wasn’t heavy-handed (I don’t enjoy romances dressed up in mystery clothing). And I really liked that Angie resolved one of the subplots by turning to books and beating the town council at its own game. Glad to see I have more to read in this series. I thought it would be a serious-crime-slash-thriller-story with a slow pace and boring character. Boy was I wrong. I really enjoyed this one. Love the character, the Amish background (and the community!) and the story. Makes me want to have a quilt shop too in Rolling Brook haha! 50 States and at least 50 Authors 2016 Reading Challenge. OHIO.Angie has been permitted to enter some of her late Aunt's quilts in an Amish auction. Wanda is found dead just outside the auction and Rachel is implicated because she had given Wanda a blueberry fry pie. However, Angie is out to prove Rachel is not responsible for Wanda's death even though Wanda apposed the pie factory that Aaron and Rachel wanted to build in Rolling Brook. A visit to Running Stitch quilt shop is a recipe for a fun read. Angie, the shop owner, discovers a body at the Amish auction but refuses to accept that her Amish friend is the murderer. The ineraction of Angie with her dog Oliver and his friendship with her cat Dodger keep you smiling. Add a naughty goat called Petunia to the mix for extra fun. I liked that this time there was a twist to the plot at the end. Looking forward to the 3rd in the series. Nice build up from the first book. So far the characters are keeping my interest. The sheriff and Angie bit is filling out nicely. You could see the ex boyfriend coming a mile away. That alone has me waiting to read the third installment. A fun book to read. I love the quilting theme. It was an easy audio book to listen to while I did other things. Fun, easy read with a few twistsI enjoy reading about a different lifestyle from mine. The Amish background is well researched. The story is entertaining as are the characters. Read it all at one sitting. Book 2 in the series. A nice cozy Amish murder mystery with quilting, baking and romantic hints. Easy to read story with some fun plot twists. Angie was irritating at times with her naivety and actions. I have learned in this series to follow the family for clues. Very fast, entertaining read. Love this series....looking forward to reading the remainder of it. I received this book from the author, Isabella Alan, for no charge in exchange for my honest review of this book. The opinions expressed here are my own.Book Description: When Angela Braddock enters her quilts in an Amish auction, she never expects one of her neighbors to end up going, going, gone....Angie is finding her niche as the new owner of her late aunt’s Amish quilt shop, Running Stitch. But as the summer is winding down, so is business. To bolster support for the shop, Angie decides to sell her quilts in the Rolling Brook Amish Auction, including some of her aunt’s most prized works.The quilts promise to be a hit—but the gavel comes down on the lively event when Angie stumbles upon the body of township trustee Wanda Hunt behind a canning shed. The cause of death: a poisoned blueberry fry pie from Rachel Miller’s bakery table. Now Angie’s closest friend is a murder suspect. With Angie taking the lead, she and the other women of her aunt’s quilting circle set out to patch together the clues and stop a killer set on shredding the simple peace of Rolling Brook.Includes Quilting Tips!My Thoughts: Murder, Simply Stitched is the second book in Isabella Alan's series, The Amish Quilt Shop Mystery Series, and it is FANTASTIC. I had the pleasure of reading and reviewing her first book in this series, Murder, Plain and Simple, so I was excited to get the chance to for this second one. Angela Braddock is running the quilt shop her Aunt left her,Running Stitch, and finding her place in this Amish society. To help make ends meet and get some advertisement for her shop she enters some of the quilts her aunt made. With the help of her lifelong friends, The Grabers, she gets a spot in the Amish Auction. While walking around the auction ground, Angie walks into a crime scene, Wanda Hunt a town trustee, on the ground with a blueberry fry pie in her hand. Just like the one Rachel Miller gave Wanda after they had words about the Miller's plans to open a factory for their bakery which Wanda has been against. Wanda Hunt died from an allergy to peanuts. Peanuts that were found in the fry pie Wanda had been eating. So Angie and the other women from their quilting circle set out to find out who did this and to help the Miller's get approval for their factory. Murder, Simply Stitched is a FANTASTIC story. I love Isabella Alan's writing and have had the pleasure of reading the first book in this series, Murder, Plain and Simple. As a huge fan of Amish Fiction and suspense books, this series is PERFECT for me. Isabella Alan writes with authority on The Amish, Quilting, baking, auctions, and police investigations. I find once I start reading Isabella Alan's books I cannot put them down and they keep me guessing until the end. I love the array of characters Isabella Alan has come up with, the new ones and the old ones but I would have to say in this book I have a few favorites, including: Angie's dog Oliver, her cat Dodger, and Petunia the goat from the auction farm. These animals have a very uncommon bond and take care of one another. Their escapades keep you laughing. I found myself laughing out loud in quite a few parts and holding my breath in others as the action happened. This book kept me guessing until the end. This book can be read as a stand alone. Isabella Alan does a great job making sure new readers have enough information to not feel lost, but not too much that "old" readers find the details boring. I highly recommend this book to anyone who enjoys Amish Fiction and/or Suspense Fiction, you will not be disappointed. I cannot wait to read the next book in this series, Murder, Served Simply, set to release December 2, 2014! I give this book 5 STARS. Angie's new business venture operating her late aunt's Amish quilt shop has been a success throughout the tourist season. Angie sets up a booth at Rolling Brook Amish Auction in order to sell some of her quilts and a few of her aunt's prized quilts to keep her afloat throughout the looming winter months. The sudden death of township trustee Wanda Hunt is considered a homicide, and Angie's dear Amish friend is accused of poisoning her. Angie and her Amish quilting circle brainstorm to disprove that theory! Throughout this tale of mystery and intrigue Angie finds herself in the most bizarre situations, lending a comical element to this Amish mystery. Her "city"dog Oliver takes cover at the sight of a bird, yet is overprotective of her kitten, watching over him like a mother hen. Mischievous twins and a goat named Petunia add to the shenanigans, and provide wacky entertainment throughout the story. Sheriff Mitchell doesn't appreciate Angie's presence at the crime scene or her unsolicited appearances throughout the investigation of Wanda's death, but his gorgeous eyes appear to convey more than irritation. As you might have already gathered, this Amish mystery covers numerous elements that prove to entertain, intrigue, and keep you turning pages to transport you to the next development!Isabella Alan pens a story that is filled with adventure, wit and colorful characters that will keep your interest until the last page. "Murder, Simply Brewed" is a delightful blending of all the great characteristics that will keep your interest and curiosity piqued throughout the entire story. Never a dull moment is to be found in this captivating read! The author has written this book in the first person and does a fantastic job of it. I enjoyed this book so much I'll undoubtedly read it again. The author develops a descriptive, fast-paced adventure of activities that are creative and penned in a unique style. I highly recommend that you pick up a copy of this book and settle in for a long evening of entertainment!Disclaimer: I received a copy of this book from the author in exchange for my honest review. All opinions expressed are my own, and no monetary compensation was received for this review. OUT's ReviewWednesday is always a big afternoon for me. It’s my regular standing day to visit one of my most favorite specialty stores, Yoder’s Dutch Market. Some days I go right in and pick out what I need, other days I like to stroll down the aisles and see what is new. This market place has a calming atmosphere for me. Amish Fiction has calming effects on me as well. There are very few Amish Fiction authors that I follow. However, one more has been added to the list, Isabella Alan. I adore a story with well developed characters. Murder, Simply Stitched has it. I adore settings that pop straight out from the pages, straight into you mind and into your world of pure visualization. Ms. Alan, opens her story up with such a scene. Her attention to details, the story line, and the notion to ensure that readers are guessing and thinking until the very end was clearly deliberate in her writing process. The main character Angela, is on a mission. Quilting is her hobby and current income source. Deciding to visit an auction, proves to be more than she has bargained for when she stumbles across, what she feels is a murder scene. This novel is all about "who did it." With the setting being an Amish community, you just can't possibly imagine that something like this could happen in a peaceful area. Or can it? Although, this is a true mystery, there is a focus on a love interest sprinkled through the pages. Which is always a great touch! And just in case you are worried that you have to read previous novels of the series to understand what is going on. You do not. This is one of those series where, you become engaged with the characters and story line and rush to pick up any novels that you haven’t read. This is one you will truly enjoy. Additional Note:Isabella and I had a great “Casual Conversation” over at A Leisure Moment about all kinds of great stuff. This podcast is later in the blog tour, so we’ll be sure to keep you posted! Township Trustee, Wanda Hunt, is found dead behind the canning shed at the Rolling Brook Auction after eating one of Rachel's fried blueberry pies. With Rachel's husband Aaron at odds with the trustees over a pie factory, they are the prime suspects. Angie is on the case to clear her friends and find the real reason behind Wanda's demise. This lost a little of the charm from the first book in the series but I found it an enjoyable read. I picked up on the red herring as the culprit for most of the book but was able to correctly guess right before the murderer was revealed. The reveal and the reasons behind the murder made me sad. Ms. Alan did a good job of subtly getting her message across that I am still thinking about a day later. What I liked about this book: The setting: I live in Columbus and have been to Holmes County and I quilt. I like to read about something so familiar. Angie is a good protagonist and I look forward to her character developing due to the twist at the end of the book. I like the budding relationship with James Mitchell but can't wait for ex-fiancée Ryan to make an appearance along with her parents in the next one. I also like how the Amish are portrayed in these books. Ms. Alan has done her research and isn't condescending nor reverent toward the Amish lifestyle. I was happy Martha Yoder wasn't a major character and look forward to Angie figuring out how to deal with the new rival quilt shop. The twins and Petunia the goat-enough said. What I didn't like about this book: Although quilts were a part of it, I wished the quilt shop itself played a larger role. Angie didn't seem to spend a whole lot of time there running her fledging business while off investigating Wanda's death. And I had a hard time with how easily people were willing to talk to her considering she is non Amish as well as new person in Rolling Brook. James' ex-wife came across a little over the top and while I liked the character of Reed, I felt his resolution was a little hokey. Angie can't seem to help herself getting involved in her friends' problems. When a town council woman ends up dead with one of Angie's friends Rachel and Aaron's fry pies in her hand she has no choice but to investigate on her own to help her friends.The council woman was opposed to Rachel and Aaron building a pie factory, therefore that gave them motive to murder her. Angie knows her Amish friends would never do such a thing so she starts asking questions to help the investigation along much to Sheriff Mitchell's dismay. The sheriff and Angie are attracted to each other, but Mitchell is adamant that Angie stay out of police business. Of course Angie doesn't listen! I love how Angie is fitting in to the community. She's a friend to the English and a friend to the Amish and she champions any of her friends. One of the other things I enjoy about the series is Angie's dog Oliver, cat Dodger and being introduced to Petunia the goat. Oliver is a character! It almost seems as if he truly does understand what Angie says to him. His character makes for many light-hearted scenes along with some laughable antics between the animal characters. Angie's character makes me alternate between admiration and exasperation! I admire her loyalty to friends and her willingness to help a friend out, but I get exasperated at her dogged determination to poke around where she's been told to stay out. But I think that is part of what makes her character likable too, she'll do whatever it takes to help out a friend, especially to clear them of murder! Murder, Simply Stitched kept me guessing the whole time as to who the murderer was, and I was totally surprised. Mitchell and Angie's relationship kicks off in this installment, and I have to say I'm a fan of that! Angie is expecting her parents and a tag-a-long for the Christmas holidays which look to be a bit complicated. Looking forward to seeing what happens next. Isabella Alan - Isabella Alan is the pseudonym for Amanda Flower, an Agatha-nominated mystery author, started her writing career in elementary school when she read a story she wrote to her sixth grade class and had the class in stitches with her description of being stuck on the top of a Ferris wheel. She knew at that moment she’d found her calling of making people laugh with her words. Her debut mystery, Maid of Murder, was an Agatha Award Nominee for Best First Novel. Amanda is an academic librarian for a small college near Cleveland.